If your goal when horse race betting is only the long term profit it may not matter to you where you place your bets. When you are only concerned with the absolute best opportunity for return, you may find you prefer betting exchanges, or online sportsbooks. These options have very small overhead and a much smaller take from the wagers so a greater percentage of money is paid out to the winners. But betting on horse racing isn’t always about counting pennies. Many people love the thrill of horse race betting. Horse racing was considered the sport of kings and to this day has a very prestigious appeal to it. 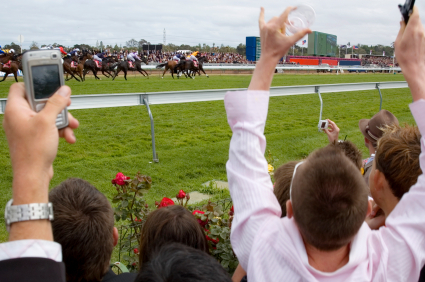 But with all the benefits of horse race betting online, why do people still go to the track? While you can view the race programs both online and at the track, some bettors prefer to see the horses they bet on live. Not everyone takes advantage of the viewing area where the horses are saddled and warmed up prior to their race. This is a great opportunity to get a first hand up close look at your picks as they’re saddled. Perhaps your favourite sometiems wears blinkers and sometimes does not- this is a great moment to see if they have a last minute equipment change. Perhaps your favorite part of race day is watching the horses, then you will love the warm up circle. This area is where the horses are walked in a small path after they are saddled to stretch their legs and get ready to race. If you like to bet on spirited horses numbers don’t always depict a horse’s personality and simulcast racetracks do not always have the airtime to show the warm up walks. While many people love horse race betting because of the possibility of a big win, and the thrill of watching the horses run that isn’t the only reason spectators flock to this sport. The biggest benefit to watching and betting on horse races at the track is the atmosphere. Horse racing has long been known as the sport of kings. It is very prestigious, and a relaxing day out. Many people who head to the track will sit infield and lounge on the grass and have a great relaxing family time. However some people love the glamour. The track is a great place to wear your nicest dress and a large statement hat or fascinator. This tradition is especially prominent at the Kentucky Derby, where worldwide people will celebrate and have hat-parties at home if they cannot attend. Men and women alike will dress up for the occasion, but the primary accessory is the fancy hat. Betting live at the track can be thrilling. The electric atmosphere and how excited the crowd gets on a close race cannot compare to watching a race at home, alone, online. Watching the huge, powerful horses snort and stomp as they walk by is impressive and intimidating. Winning your bet and being handed the crisp bills and the sweet smell of the hay and grass are intoxicating. Cheering on your horse to win with other bettors is exciting! Online horse betting can be convenient- sometimes too convenient. For bettors who have gambling problems just avoiding the track is hard enough, but online gambling can make it too easy to overdo it. Considering that bank transfers, credit cards, and e-wallets such as moneybookers make it so fast and easy to fund bank accounts it can be very easy to go overboard. While they have the same value as cash it can be easy to forget that as those numbers go up and down that is your hard-earned cash. If you want to limit yourself to a strict budget it can be far better to play at the track. If you leave your credit cards and bank cards at home, you can only bet with the cash you brought with you. Regardless of how much fun you’re having, you should never risk more than you can afford to lose. Responsible gambling is fun gambling!